The alliance of showtunes and class revolt are not so far removed as one might assume. The original troubadour of the American worker’s plight, Joe Hill, fueled the early 1900’s labor movement with songbooks that borrowed not only from the hymnal and the American folksong, but also from vaudeville and the music hall. It was Hill’s philosophy that populist activism could be galvanized by popular artistic forms, sparking both the social imagination and political will of the downtrodden. Haymarket, within the most visible, commercialized form of the American theater—the musical—seeks to revive the camaraderie between show biz and the show down with capitalism-run-amok. This is precisely why, despite some of its shortcomings, one cannot help but applaud Haymarket’s spirited fist-raising. (left to right) Amanda Giles, Joey Harbert, Erik Pearson, Eric Loughlin, Elleon Dobias, Mike Mazzocca, T.J. Anderson, Sarah Beth Tanner, Kelan M. Smith, Melanie Vitaterna, Josiah Robinson and Bridget Adams-King in Underscore Theatre Company and The Den Theatre’s new musical HAYMARKET. Photo by Michael Brosilow. Co-produced by Underscore Theatre and The Den, this proletariat musical chronicles the infamous events of the Haymarket Affair. The story takes place here, in industrial Chicago, amid a groundswell of labor movements demanding regulated workplace conditions, an end to child labor, and the 8-hour workday. Protesting the murder of several labor strikers by police the day before, a peaceful demonstration on May 4, 1886 turned into chaos when an unidentified individual lobbed a bomb into approaching police forces. Albert Parsons (Erik Pearson), August Spies (T.J. Anderson), George Engels (Mike Mazzocca), Adolph Fischer (Josiah Robinson), and Louis Lingg (Joey Harbert)—none of whom were at the rally when the explosive went off—were subsequently convicted of conspiracy to murder. All were sent to the gallows save Lingg, who committed suicide (by explosive) in his prison cell before reaching the noose. Time, testimony, and international attention would not only vindicate their claims of innocence and damn the sham of a trial that led to their execution, but would ultimately fan the flames of the swelling labor resistance. Intelligently, writer Alex Higgin-Houser constrains the sprawling historical narrative by training the spotlight of memory on Albert Parson’s wife, Lucy. A daughter of a slave and a resilient organizer, Lucy prefigured the current surge of women and people of color taking the lead in the fight for social justice. Perhaps this is why costume designer Christina Leinicke has her garbed in an anachronistically modern dress amid the otherwise period-evocative outfits. Pipe-blessed vocalist Bridget Adams-King plays Lucy with sincerity and steely resolve, although her temptation toward violent revolution feels underdeveloped in writing and direction. Pearson, a warm-timbred warbler, also gives a charismatic performance as Albert—though he’s never prodded to explore much beyond the palette of affable wholesomeness. (left to right) Mike Mazzocca, Elleon Dobias, Joey Harbert, Erik Pearson, Melanie Vitaterna, Amanda Giles, Josiah Robinson and Kelan M. Smith in Underscore Theatre Company and The Den Theatre’s new musical HAYMARKET. Photo by Michael Brosilow. The other members of the Haymarket Five give voice to an array of competing ideas threatening to undo the worker’s movement at the time. They intone various axioms of anarchy and socialism while advocating methods ranging from pacifism to armed revolt. Over the course of the two-acts, Higgin-Houser evolves most of them from instrumental archetypes to plausible personages. The German immigrant and anarcho-journalist August Spies receives a standout, second-act performance from the ever-grinning Anderson, whose courtroom “speechifying” balances both hilarity and conviction. Although Higgin-Houser merely glosses the rationales and material conditions which would make us sympathetic to the coterie’s more extreme philosophies, he should nonetheless be credited for his patient crafting of winsome characters. In his most nuanced moments, he also demonstrates that he knows how to satisfyingly weave and invert motifs in both lyrical and thematic registers. 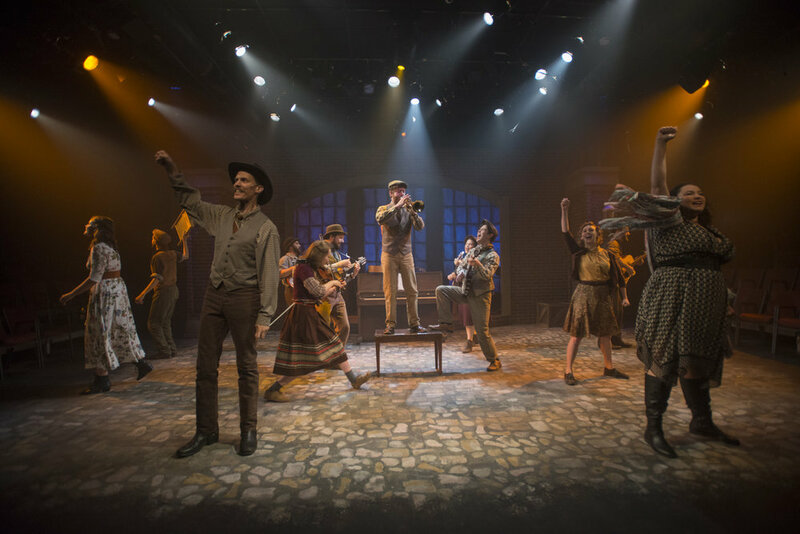 Under the new direction and choreography of Nick Thornton, Haymarket’s unembellished staging foregrounds the theatrical potentials of straightforward ensemble storytelling. At times, however, Thornton’s competent orchestration of bodies is beset by a clumsy stage picture or half-realized action. Through minimal means, he conjures a clandestine pub interior, a bustling street, and a carnivalesque hall of tom foolery—all in front of Eric Luchen’s adaptable brick and frosted glass façade. In this endeavor he receives much aid from Erik Barry’s sophisticated lighting design, under which you could probably stuff the actors into a cardboard box and be gifted a dozen or so imaginary spaces. Thornton coaxes forth many effective moments of wit and levity, and the physical comedy in the circus-courtroom sequence (Higgin-Houser’s most interpretive intervention in a book that flirts with antiquarian commemoration) evidences his knack for humor. But when the dramatic stakes intensify, some scenes feel guided more by strained sentimentality than by emotional truth. Haymarket, however, receives a solid aural foundation in David Kornfeld’s compositions. The score’s musical consistency inflects the popular show tune with folksy Americana, rather than “I’ll take my bourbon neat” bluegrass. Kornfeld’s arrangements nimbly modulate with the emotional twists of the narrative and, thankfully, manage to rescue a few stretches of clunkily rendered historical exposition. Paired with the impeccable musical direction of Robert Ollis the songs in performance present the ensemble at their best. 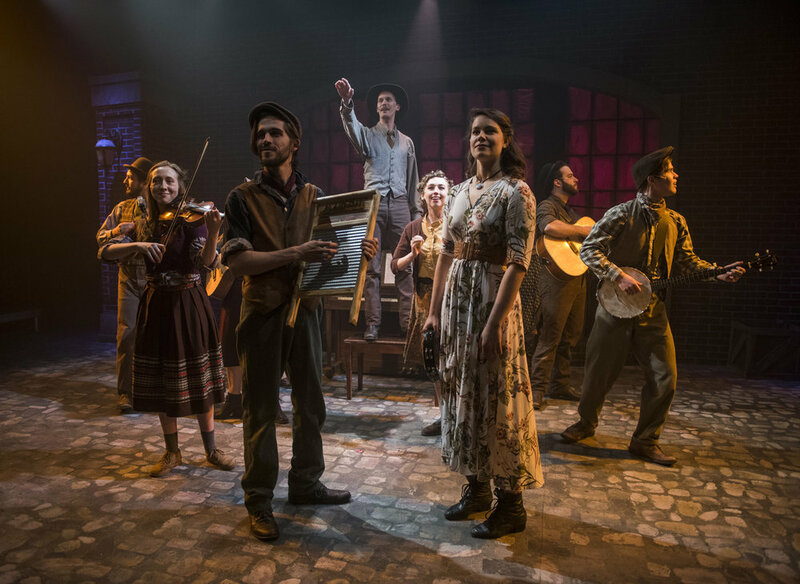 (center) Bridget Adams-King with (l to r) Josiah Robinson, Mike Mazzocca, T.J. Anderson, Sarah Beth Tanner, Kelan M. Smith, Amanda Giles, Eric Loughlin, Melanie Vitaterna and Erik Pearson in Underscore Theatre Company and The Den Theatre’s new musical HAYMARKET. Photo by Michael Brosilow. After a successful 2016 iteration which won them a Jeff nod for Best New Musical, Higgin-Houser and Kornfeld spent two years reworking Haymarket’s current instantiation. Their commitment to refining their already well-received piece betrays their infectious belief in the project, which seems to have been transmitted to its improbably multi-talented cast of actor-instrumentalists. That the audience is invited into this well-wrought ethos of collective hope is probably Haymarket’s greatest achievement. HAYMARKET will play June 13 – July 22, 2018 at The Den Theatre’s Heath Main Stage, 1331 N. Milwaukee Ave. in Chicago. Tickets are currently available at www.underscoretheatre.org or by calling (773) 697-3830.